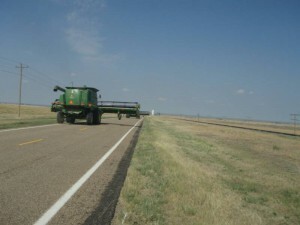 With harvest underway drivers need to pay extra attention to the roads. During the next couple of months our rural roads and highways will be covered with farm machinery and trailer trucks as the farmers move from field to field harvesting their crops. According to U.S. Department of Transportation a large portion of motor vehicle fatalities occur on rural roads in Mississippi. Rural traffic is often overlooked because of the drivers sense of ‘familiarity’ with the location. However, with many of the population using some type of electronic device including cell phones or GPS it only multiplies the risk. Keep in mind that most farm machinery is moving at a much slower rate than many motorist when it comes to highway travels. 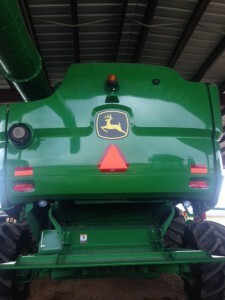 For instance, if you are traveling at the posted speed of 65 mph and a combine is 1/2 ahead of you traveling at 15 mph in the same direction it would only take 36 seconds for the two to meet. Now say that there is only 1/4 in between, the time has been halved to 18 seconds. Department of Transportation says the average person sending or receiving a text takes the drivers eyes away from the road for about 5 seconds. It wouldn’t take long for someone to lose concentration and find themselves dangerously close to having a collision. 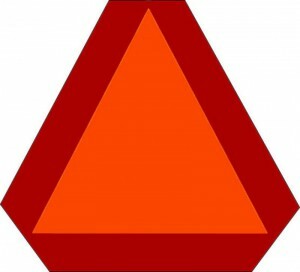 Always pay attention and look for warning lights as well as slow-moving-vehicle (SMV) placards. These placards alert to slow down and keep a safe distance between you and the slower moving traffic until it is safe to pass. The following are some tips for both farmers and drivers to keep in mind to help keep this harvest season safe. Last updated August 15th, 2016. Technical problems, contact support.